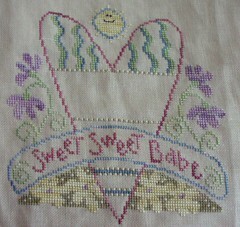 Nicole's Needlework: Sweet Sweet Babe - almost finished! Nicole, I just love that birth sampler, it's too cute and the colors are really gorgeous. I know what you mean about routine, I hate for mine to be disturbed too much, glad you had a quiet day :-). Wow, you stitched this up fast. It came out very pretty. That makes such a pretty birth sampler! My needlework guild is very similar to your shop situation. There are chart nazi's there also. And there are some gossipers, which make me feel like I'm back in high school. But for the most part, its an enjoyable evening and the majority of the ladies are great. Oh its lovely Nicole and hsn't it stitched up fast. This design is so sweet. You have done a beautiful job. Ann. What a sweet baby sampler Nicole! Glad to hear you got some quiet time for yourself. Such a charming piece! I love the colors. I don't know how you have time to stitch at all with your busy schedule. Glad you do, though, as I enjoy your blog! This is looking great! I can't believe all the stitching you manage to get done with your little ones! Beautiful piece! Oh, it's turning out beautifully! I'm interested to see how you finish it.